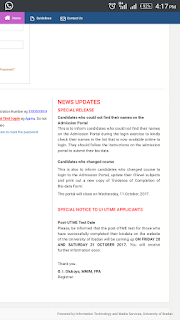 University Of Ibadan, UI Post UTME Screening Exercise Exam Date For The 2017/2018 Academic Session Has Been Announced. 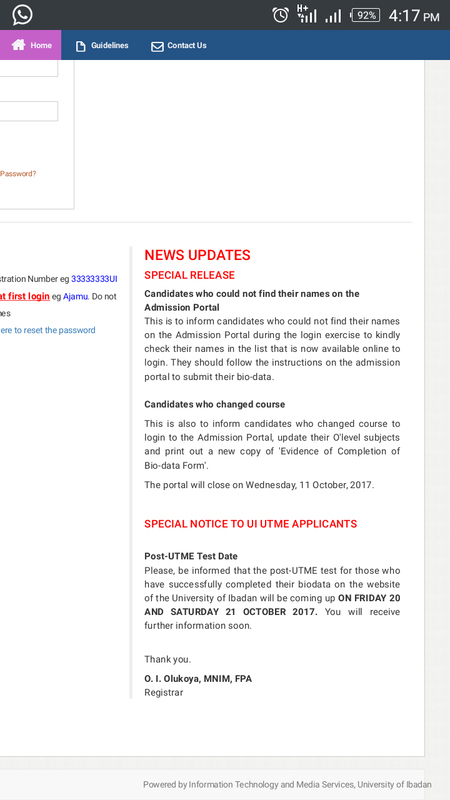 Please, be informed that the post-UTME test for those who have successfully completed their biodata on the website of the University of Ibadan will be coming up ON FRIDAY 20 AND SATURDAY 21 OCTOBER 2017.You will receive further information soon. This is to inform candidates who could not find their names on the Admission Portal during the login exercise to kindly check their names in the list that is now available online to login. They should follow the instructions on the admission portal to submit their bio-data. 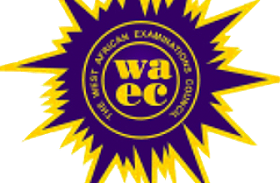 This is also to inform candidates who changed course to login to the Admission Portal, update their O’level subjects and print out a new copy of ‘Evidence of Completion of Bio-data Form’.